Hey, everybody! Antoni, here! As promised, I decided to make a piece of Brick, Butch, Blossom, and Buttercup fanart, after reading a good amount of fanfics mainly involving them. 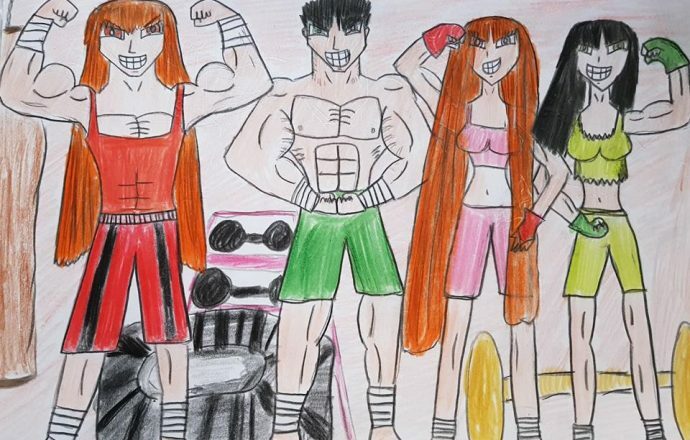 So, for your viewing pleasure here are, from left to right, Brick, Butch, Blossom, and Buttercup aka my most favorite bruisers in all of cartoon history posing after a nice, intensive workout plus doing a lot of Muay Thai. I took the liberty of drawing them in my style, as opposed to the original style by Craig McCracken because I kind of wanted to put my own spin on it, for lack of a better explanation. To make this more fun, I am inviting you guys to caption this picture. Yes, I have also gotten myself into the world of Caption This! So, please go ahead, be creative, and comment your captions for each of these four characters, I would be very happy to read them. Based on this piece of fanart I did, I aged all four of them up to what I think they would look like in 2018. Brick and Butch are 25 going on 26, and Blossom and Buttercup are 25. As much as I want to show it, Brick is married to Blossom and Butch is married to Buttercup, and they have been really close-knit not only with their respective spouses but also with their siblings and siblings-in-law. Starting off with Brick, I wanted to keep his large-and-in-charge and proud attitude when making this. Plus, I always found him absolutely gorgeous with long hair and he seems to be the type of guy who is charming in his own way but will beat you up when you cross his path. Moreover, I could see him ritualistically having heated sparring matches with Butch and some friendly ones with his wife and sister-in-law, Blossom and Buttercup respectively. In terms of his cap, I decided to omit that because I do fancy Brick letting his hair down. Butch was pretty easy for me, as he is the muscle and the overall big guy. I made him buffer than Brick, which is saying something, and I thought it would be nice to see Butch showing off his vascular veins. I am not good at drawing vascular, so, any fellow artists who can draw an older, more muscular Butch or even Brick, please I would also love to be inspired by your works. Personality-wise, he still has his impulsive attitude and his passion and love for going physical. Sometimes one has to leave it to Brick to discipline him in his own special way, Blossom to tame the beast within him, and Buttercup just to enjoy being with him. I actually enjoyed drawing Blossom, as she and Buttercup have always been my two favorite Powerpuff Girls. Yes, Blossom is very well-known for being the intelligent strategist at best and bossy at worst but I wanted to also bring out that bruiser personality in her. She has proven that in her battle with Princess Morbucks from “Stuck Up, Up and Away”, which, by the way, was Blossom’s greatest shining moment, and many other episodes in which she can fight to the best of her abilities. Plus, I did enjoy drawing her long Rapunzel hair and letting it down. I have always preferred it that way. Buttercup was, of course, a joy to draw. I wanted to make her hair longer, as it looked cuter than her signature shorter hair. I also wanted to keep her femininity intact, even though she is the polar opposite of Blossom, thus having Buttercup’s top slightly tattered. Plus, I always have a blast when Blossom and Buttercup engage themselves in combat. I can certainly envision that, as they seem to spar with each other all the way up to their adulthood. For quite some time, I have been toying with the idea of making fanart involving Brick, Butch, Blossom, and Buttercup, after reading and recommending some fanfics mainly involving them and looking at some fanart for inspiration. I have to say that the results were satisfactory. It took time for me to get the positions, body types, and the characters pegged down, as it was not easy at all. Still, it was an utter joy to have made this piece of work and I want to do a lot more. Thanks for reading this and having a good look at this fanart. I hope you all enjoyed it, happy captioning, and have a lovely day. 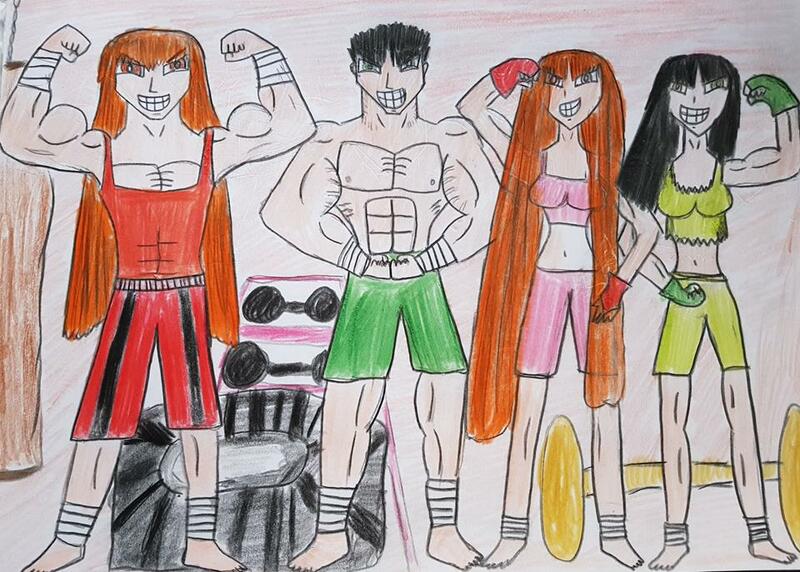 Brick, Butch, Blossom, and Buttercup from The Powerpuff Girls all belong to Craig McCracken.